We here at PCPC partner with many different companies in an effort to offer our clients the most robust array of technology tools possible. In doing so we continuously aim to be among the best IT services New York has to offer. Throughout this process, we've been fortunate enough to learn from many industry experts and implement some of their knowledge into our operations. When individuals like these speak or post on their sites we make it point to hear what they have to say and may share it through our various twitter or blog. Dana Liedholm who is the Chief Marketing Officer at our partner ID Agent wrote the following. Also, there are tons of fake shopping apps out there, so if you want to download a shopping app from your favorite store, best to get it directly from that store’s website to be sure it’s legitimate. Websites that have security enabled using SSL (Secure Socket Layer) encrypt data during transmission, making it safe to use a credit card on that site. Look for that little lock in the address bar and a URL with “https” instead of “http” at the beginning. Just avoid shopping on public Wi-Fi networks, like in airports or coffee shops. While this may seem like the perfect time to knock out that shopping list, open hotspots are extremely dangerous. Hackers have been known to intercept communications between you and the connection point so that instead of talking directly with the hotspot, you end up sending your information to the hacker. In this case, the hacker has access to all the information you send out—emails, phone numbers, credit card information... And once a hacker has that information, you’ve basically given them the keys to your front door. Be sure to keep software up to date on any device you connect to the internet, to help reduce the risk of infection from malware. Wherever you do find yourself, it’s important to use a VPN (virtual private network) Service which creates a private tunnel from your device to your service. VPN Servers will encrypt your traffic passing through the public Wi-Fi hotspots. Consider making your passwords sentences, like “CountryMusicIsTheBest!” and make them unique to every site. Don’t ever use your work email or any variation of your work password on any third-party websites and monitor for exposure! Consider finishing out the year strong by using a password manager to assist in dealing with the ever-increasing volume of complex and unique passwords and as always, enable multi-factor authentication (MFA) if it’s available. 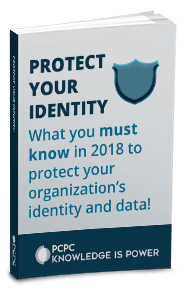 With ID Agent’s Dark Web ID™, MSPs can monitor for exposure of their customers’ employee credentials on the Dark Web. And with SpotLight ID™ they can offer protection against personal identity theft. We wish everyone happy and safe shopping this season! How Much Could a Cybersecurity Breach Cost Your Business?